Discussion in 'Android Devices' started by Jethro, Jan 18, 2010. Hi, after working well for the first month or so, it looks like GPS is not working very well for me. I'm not sure what changed. I now, when using the locate feature in GoogleMaps, often find myself in the middle of the Pacific off the SoCal shore. I usually try to remain on land when possible, though. Or it my randomly 'teleport' me a few hundred yards off in some direction, then I'm back withing seconds. But a lot of the time it's not able to really locate me well at all. I think the network locating is doing 'ok', but GPS is failing pretty bad lately. The icon shows GPS working, and I try disabling and re-enabling it. But that doesn't help. - Anyone else having issues with GPS accuracy? - Any apps that can help 'fine-tune' the GPS? Note that there is really nothing to "fine tune". OTOH, this app can help you observe a few things about your GPS's behavior which will help you decide what the problem is ... more on that in a minute. The other thing to be aware of is that on the Eris, even though you have the GPS device "enabled", the GPS receiver doesn't start producing fixes until an app on the Eris starts asking for them - you will notice this when you first start up either Google Maps or GPS Status - the first couple of fixes will be poor. - Like any radio, they can experience reception problems when shielded from the transmitting sources - for instance indoors (esp in buildings with lots of metallic objects overhead), or in a pocket close to your body. They will perform best outdoors with a relatively unobstructed view of the entire sky... all the way to the horizon, if possible. - Like any radio, they are susceptible to interference from some types of electronic devices. - They produce an error estimate along with every "fix". - The constellation of satellites overhead is constantly changing - even at the same location, the quality of GPS fixes will change over time because the number of satellites visible to your unit will change. This will be most likely to be seen when you already have a weak signal, such as indoors. There is some electronic equipment nearby which generates radio interference. If you really thought you have a bad GPS device, take it to several different places, preferably outdoors, and see if the fix error jumps around a lot (more than 100+ feet). If it jumps around a lot when there are lots of satellites shown overhead, you have good (green) signals, in all the places you test it, then you might have bad hardware. If it only jumps around in one location, that is probably a reception or interference issue. 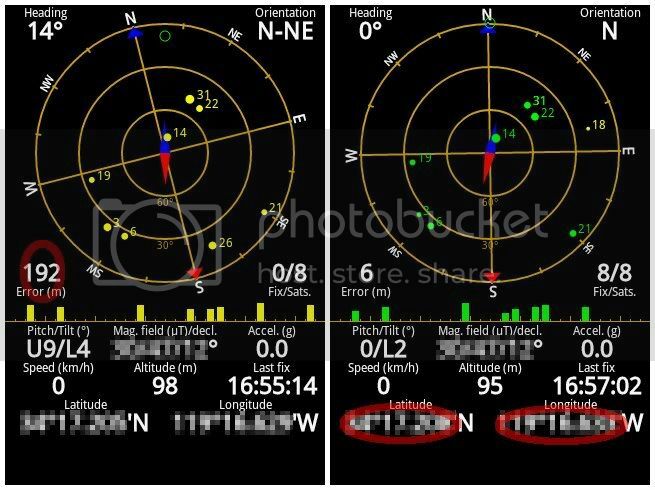 Whats the most accurate setting to allow the GPS location to be very close? Do i turn wireless networks off and just enable Location Setting with GPS? whats the best setup? Thanks, I downloaded the app and keep an eye on it next time I'm driving around. I usually keep my phone mounted up by the window when I'm driving, though. Should get good reception. So it looks like I want to see low and consistent numbers for the error field, and mostly green bars (satellite strength?!?). More or less, yes. If you can't get a stable signal at any location, and especially when outdoors - then it might be time to suspect a problem with the hardware.